Having the ability to measure the actual speed of your network or the Internet connection is crucial because sometimes due to varies reasons you might be getting lower download/upload speeds than the ones claimed by the Internet service provider. Although there are a lot of online speed tests available but if you’re looking for a utility that runs on your OS (rather than online tools) then “QSpeedTest” is a simple network quality and speed checker that you can try. QtSpeedTest uses a series of pinging and file downloading from various sources to determine the quality and the speed of your connection. It also lets you save these reports in HTML, XML or simple text formats and supports GNU/Linux, Windows and Mac OS X. *. It determines the quality by pinging to various servers and calculating the pining time, packet lost, network jitter calculations, average values for the category etc. For this it uses International and game servers. *. Has a parallel and serial file downloading tests for determining the speed of your network connection. *. You can stop the tests anytime you want. *. You can manually change some of its settings such as: pings per hosts, download/ping timeouts, ping threads and a few more. 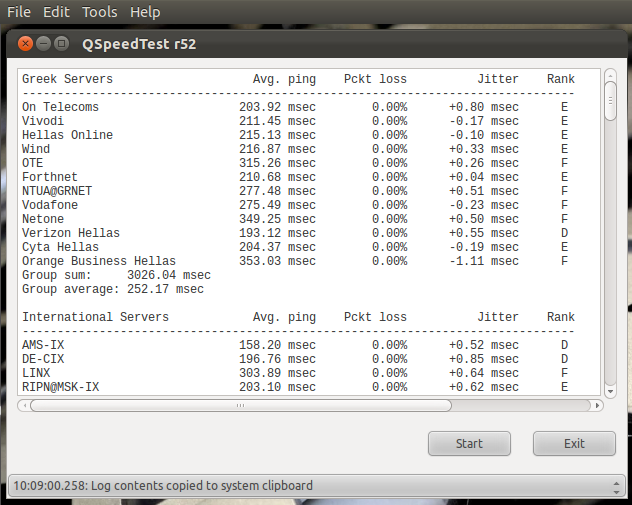 Well that’s pretty much “QSpeedTest” :). Oh I almost forgot, you can also manually enter a server list to replace the built in ones for testing too. 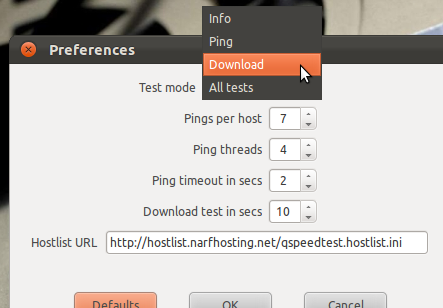 If interested you can install QSpeedTest in Ubuntu 12.04 Precise Pangolin, 11.10 Oneiric Ocelot, 11.04 Natty Narwhal, 10.10 and 10.04 by simply downloading the “.bin” (executable) file from this official QSpeedTest download page (including binaries for Windows and Mac OSX). Once the download completes, extract the content to somewhere and double click the file called “qspeedtest” (as shown below) and it should open the program. So, if you wanna find whether your ISP lives up to their promises then try using ‘QSpeedTest’ :). Good luck.